Just a few hours ago, NASA's Swift spacecraft spotted a gigantic detonation in M31, better known as the Andromeda Galaxy. And astrophysicists suspect that it might have been one of the most powerful happenings in the Universe, a gamma ray-burst that, in just a few seconds, could have emitted as much energy as our Sun in its whole lifespan. If confirmed, this will be the closest gamma-ray burst we’ve ever spotted, and it will also help scientists discover more about these mysterious pulsations of energy. Gamma-ray pulses are so prevailing, that if one happened within our galaxy, they could possibly trigger mass extinctions on Earth, explains Dr Alan Duffy, an astrophysicist at Swinburne University of Technology in Melbourne. [Update] It wasn't, in its place being a known X-ray cause caught by error. The story of how initial data, a programming bug, and a thunderstorm combined to lead us astray is still pretty neat. Scroll to the end for the rest of the "...never mind" or read straight through to get the story as it unpacked in real time. And the entire world is now looking to see what comes next, says Duffy. “Telescopes around the world are currently trained on the Andromeda galaxy looking in all wavelengths of light to learn more about this once-in-a-lifetime event.” The common gamma-ray bursts seem to be produced by the collapse of gigantic stars. 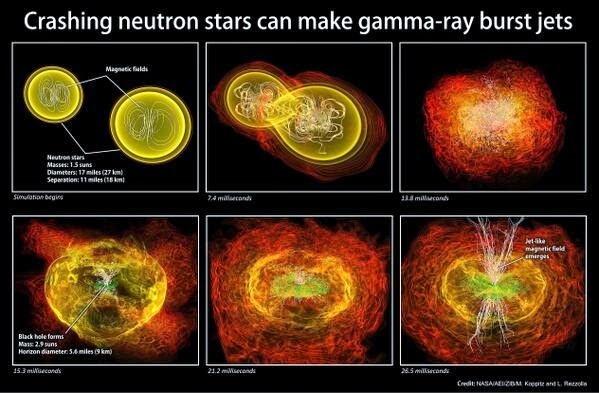 But this tremendously short gamma-ray burst may have been produced by a rare event, the collision of two neutron stars, which are the leftovers of supernovae. “Unfortunately the world-wide facility for detecting these events, LIGO, is currently shut down for an upgrade and missed out on the explosion - and a potential Nobel Prize winning discovery.” says Duffy. Till more data is studied, it's unclear what precisely this explosion was, and what produced it. 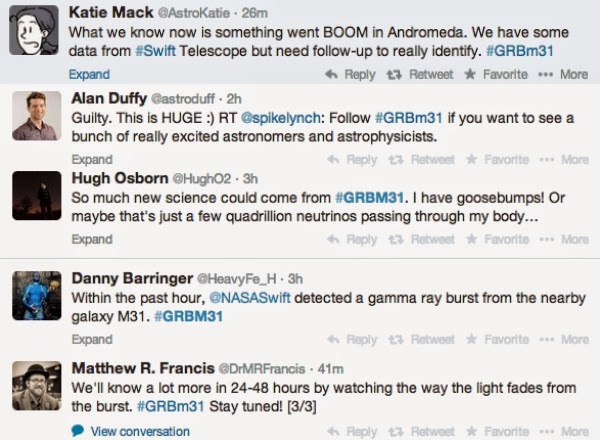 But whatever come about, this is absolutely a thrilling time to be following astrophysics. Actually, one of the most interesting things about the event is how rapidly the world has reacted to it. For the die-hard nerds, here's a copy of the GRB report.